Coltsfoot (Tussilago farfara) is a weed that goes by many names, including assfoot, coughwort, horsefoot, foalfoot, bull’s foot, horsehoof, clayweed, cleats, sowfoot and British tobacco. Many of these names refer to animal feet because the shape of the leaves resembles hoof prints. Due to its invasive habit, learning how to get rid of coltsfoot plants is important. Early European settlers brought coltsfoot to the U.S. to use as an herbal remedy. It is said to ease asthma attacks and treat other lung and throat ailments. The genus name Tussilago means cough dispeller. Today, there is some concern about the use of this herb for medicinal purposes because it may have toxic properties and it is known to cause tumors in rats. The undersides of the leaves are covered with a thick, matted white fiber. These fibers were once used as mattress stuffing and tender. Coltsfoot is a noxious perennial weed with flowers that resemble dandelions. 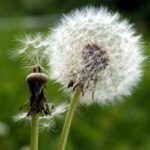 Like dandelions, mature flowers become round, white puffballs with fibers that scatter the seeds on the wind. Unlike dandelions, the flowers arise, mature and die back before the leaves appear. It’s easy to distinguish between the two plants by the foliage. Where dandelions have long, toothed leaves, coltsfoot has rounded leaves that look a lot like the foliage found on members of the violet family. The undersides of the leaves are covered with dense hairs. Ideal coltsfoot growing conditions consist of moist clay soil in a cool shady location, but the plants can also grow in full sun and other types of soil. They are often seen growing along roadside drainage ditches, landfills and other disturbed areas. Under reasonably good conditions, coltsfoot spreads by means of creeping rhizomes and airborne seeds. Control of coltsfoot is by mechanical methods or herbicide. The best mechanical method is hand pulling, which is easiest when the soil is damp. For widespread infestations, it’s easier to achieve coltsfoot weed control with an herbicide. Hand pulling works best when the soil is moist, making it easier to pull up the entire root. Small pieces of root left in the soil can grow into new plants. If the site is difficult to access or impractical for hand pulling, you may have to use a systemic herbicide. 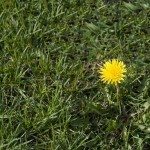 Herbicide containing glyphosate, such as Round-up, are very effective against coltsfoot. A broad spectrum herbicide, glyphosate kills a number of plants including lawn grass and most ornamentals. You can protect other plants in the area by making a cardboard collar to place around the plant before spraying.